Ik it was gonna be a problem before anakins release. 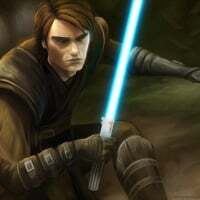 The ragdolling is crazy now that he's in, I would rather the dark side have 5 second stuns than get thrown around for 5 seconds by anakin, Obi-Wan, luke, & yoda. Even as kylo I was at full health blocked anakins pull got repulsed, repulsed, pushed, pushed & pushed & it took me 10 seconds to hit the ground. Have it to wear you cant get ragdolled after being hit more than once by a force power.